On the Tone 13 of our Ascension, we’ve been raised up to make our Way in the World. First a Transformation led by Seed/KAN helped us to discover our Self. 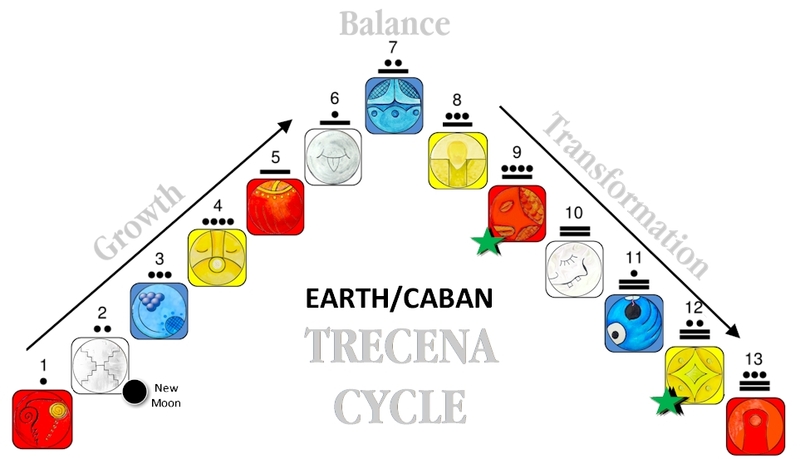 Then Earth/CABAN introduced us to our Place of Becoming. The Source of Every Answer is all around us in the 4 Directions, the Up Above, the Down Below, and in the Universe Within. As we look to the next Horizon and our Hope for the World, Mother Earth, Herself, reveals a Promise of Peace and Harmony. Sun/AHAU illuminated our Wisdom of Divine Justice, so we would know the Creator’s Plan intended for every Darkness to be Transformed by Light. And, looking more deeply at Truth we already knew, we realized that a Creator with the Power to Complete the Heavens and Earth is Capable to Complete us too. We have been raised to a Higher Consciousness that we are all children of a Common Mother. Her Beauty is our shared inheritance. Though each of us is different, we share the same substance of flesh and blood, the substance of our physicality made of the same stars… and Spirit, sharing the common Element of Ether. All the elements around us in the Natural World present our infinite possibilities to Be. Offering/MULUC is the Way of Atonement. Through a Sacrifice, a gift is given of Free Will. The Creator made the first Offering to Us. The Heavens and Earth were given freely without condition. The purpose of our Creation was for Relationship – Atonement (at-one-ment) with the Creator. Our Free Will to Choose it would become our Crown of Light. 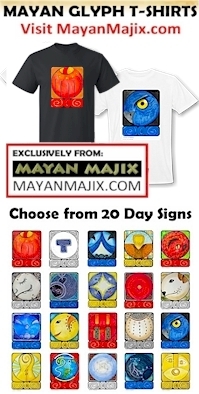 The glyph illustrates one drop raised up from the Body of our Oneness. As it returns, it creates the ripples that expand through the Whole. MULUC is the symbol of water everywhere from the Cosmos to our Tears. It also illustrates how in the vastness of the Ocean, every drop is raised up to be Seen and Cherished by the Creator. MULUC is a Day sign of the Moon and our Emotions. This is a day to Honor Feelings. Our Emotions emanate the Fire we hold within. Our Feelings share with the Creator the Authenticity of our Experience that would ripple through the Whole. At our Ascension we receive a Blessing in our Heart. 13 is the Sacred Number of the Ascended Masters and represents the power of theurgy – the power to draw Divine Agency’s assistance in Human affairs through a Sacred Ritual. We are given the Power to draw the Light of Atonement through an Offering. Our Sacred Rituals demonstrate a Choice to Be Present. By Divine Justice, we raise ourselves up to be seen by the Creator at any Time and Place of Consciousness that Only We Can Define as Sacred. The Fire and Water Elements of MULUC represent the Holy Water of a Blessing, a Purification, and a Baptism of the Ether of Spirit. Raised up from the Whole, the Creator would restore us for our Higher Purpose to ripple Love through the Whole.